Drawing on the Right Side of the Brain® right brain drawing methods were developed by Betty Edwards in the late 1960s / early 70s and immortalised in the best-selling drawing classic Drawing on the Right Side of the Brain, published in 1979. Since then, Dr Edwards' drawing methods have been used all over the world to teach millions of people how to draw. Within two weeks of publication the book went to no. 1 on the New York Times bestseller charts and stayed there for a year and, with revised editions, has remained in print ever since. It has sold over 2.5 million copies world-wide and been translated into 13 different languages. What is special about the Dr Edwards' Drawing on the Right Side of the Brain® method is that it is particularly effective at teaching drawing to those people who thought that drawing was the preserve of those lucky enough to be born with talent. The following material is based on that in The New Drawing on the Right Side of the Brain (Harper Collins Publishers, 2001)by Dr Betty Edwards (© Dr Betty Edwards). It is reproduced with permission, from Drawing on the Right Side of the Brain Inc.
Dr Edward's questions regarding her students' struggles with drawing were informed by the work of Nobel Prize winning neurobiologist Roger W. Sperry and colleagues who, in 1968 published research showing that the two halves of the brain have very different yet specific functions. The idea of the different parts of the brain having specific functions suggested to Dr Edwards that when we draw we experience a shift from our usual mode of thinking. Being able to make this shift deliberately and consciously is crucial to learning to draw from observation. You can find out more about the theory behind Drawing on the Right Side of the Brain® by reading Dr Edwards' book The New Drawing on the Right Side of the Brain. If you want to experience for yourself this "shift" that occurs when the left and right brain come into conflict try this quick exercise This exercise was developed by Dr. Betty Edwards. "Learning to draw means learning to see"
The methods developed by Dr Edwards in Drawing on the Right Side of the Brain® develop the perceptual skills necessary to see things as they really are – and so be able to render them accurately in a pencil drawing. With proper instruction the perceptual skills of drawing can be taught to anyone and they can be taught in a relatively short space of time. 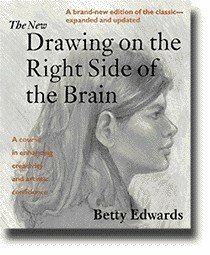 Dr Betty Edwards developed a 5-day course (affectionately nicknamed “The Killer Class”) to teach Drawing on the Right Side of the Brain®. You can also sign up for our free newsletter Drawing Matters and be the first to hear about dates for new courses, what's new on the website, plus information about drawing-related matters and events.